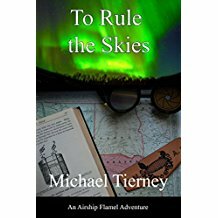 As I mentioned previously, I found To Rule the Skies: An Airship Flamel Adventure when its author, Michael Tierney, liked one of my posts and I went to visit his website. I bought it as an eBook, which is an adventure in itself. I read eBooks on my desktop Mac. Things that come through iBooks work fine, but the Kindle download is a piece of crap. As you read, it jumps to a new page every few seconds without any input from the user. The only way to successfully read is with your finger lightly on the mouse, and that only works part of the time. This is particularly irritating since the old Kindle download worked fine. Let me say at the outset that I loved this book. It was a hoot. However, I’m not sure how many of you will feel the same. It probably depends on your vision of what steampunk should be. To Rule the Skies reminded me of the books I read when I was a kid back in the fifties. Then books were straightforward, violence was muted, and nobody had any literary pretensions. Irony was unknown. That attitude may not be realistic, but it is a breath of fresh air. The plot resembled an episode of The Wild Wild West, but the crew of the airship Flamel was pure Victorian British. Stiff, long winded, formal, but that was its charm. The tone was somewhere between innocent naiveté and tongue in cheek. After all, True Grit isn’t Louis L’Amour, and that is its charm. The same thing works here. I think its time for an example. Sparks flew at every connection and disconnection. Montgomery was worried that the chamber was imbalanced and he made ready to pull the switch that would break the connection to the umbilical. “She canna take it any more!” he cried, and just as he did, the shaking stopped suddenly, and the plasma inside the chamber settled down to a slowly pulsing orange glow. He spun in his chair and checked the gauges. “All normal, Mr. MacIver! The luminous matter reaction has started!” Montgomery slumped in his chair relieved. MacIver? Say that one out loud. And engineer Montgomery shouting, “She canna take it any more!” as he performs a miraculous repair on a dying piece of high tech machinery. The pop culture references come thick and fast. I hope Michael Tierney isn’t insulted if I say it isn’t literature, but, man, is it fun. This entry was posted in A Writing Life and tagged aviation, literature, review, science fiction, steampunk, writing on October 11, 2017 by sydlogsdon.